It just might be that the next Big Thing in cooking will be an ingredient that is uncommon here in the U.S. (for now) but that the Chinese, Japanese and Koreans have known about for a long time. Shio koji is a flavor enhancer, poised to become a wonder seasoning that happens to look like gruel, more like congee actually. You could think of shio koji as a substitute for salt in many applications, but a ‘salt’ with very special properties because of two enzymes that break down protein and starch to bring out food’s natural umami and sweetness. Here, some chefs have been experimenting with it. Enthusiasm seems to be the universal reaction. One associated with America’s Test Kitchen has gotten the bug, incorporating shio koji into fried chicken and roast turkey recipes. As a menu item ingredient, the first time I had it (a better phrase is ‘aware of it’) was in shio koji chicken at Portland’s Chef Naoko Bento Café. 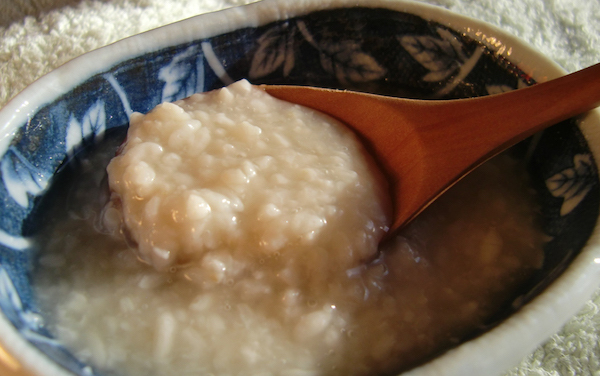 Shio koji is a fermentation of rice koji, water and salt. Rice koji itself is an interesting oddity, made by inoculating malted rice with fungal spores, called koji kin, after which they MULTIPLY. “Wow, this looks terrific!” is not the first thought likely to come to mind when food is covered with mold. You’re more likely to dump it. The thing is that koji kin, or simply koji, is essential to making miso, sake, mirin, shochu, makgeolli, rice vinegar and soy sauce. Watch the excellent documentary The Birth of Sake on Netflix to see how the sake master sprinkles koji on steamed rice. Without the mold, much of Japanese food as we know it would not exist, which makes it all the more remarkable that something that appears so unappetizing was exploited at all to make these cornerstones of Japanese cooking. Shio koji became the rage in Japan only a few years ago. According to Nancy Singleton Hachisu, author of Japanese Farm Food and (most recently) Preserving the Japanese Way, shio koji might not be so popular today had it not been for Myoho Asari (aka The Kojiya Woman), who came across a mention of it in an old Edo-period food anthology and subsequently blogged about it and experimented with it. It isn’t so easy to find in the U.S. That may change in the future. I was able to get it at a Seattle-area Asian supermarket—raw (nama) shio koji made in Oregon by Jōrinji, which also makes traditional unpasteurized miso. In my own cooking, I’ve been doing some experimenting. My introduction started out with a fantastic internet recipe for baked shio koji chicken. Baby carrots tossed with it before roasting had wonderful depth. My favorite tuna salad benefited from using shio koji instead of salt and nutritional yeast. When local berry season arrives, I’ll play around with making jams that require much less sugar. I’ll use it in stews, stir frys and dressings. The possibilities are endless. I suspect that shio koji will be appearing in menu descriptions as time goes on. You can bet that it’s already being used as a ‘secret’ ingredient. So now, to the cook’s arsenal of other umami-boosters (soy sauce, mushrooms, tomato paste, kelp, Marmite, nutritional yeast, Worcestershire sauce, MSG, etc.) can be added a by-product of a mold that looks as ancient as time itself. This entry was posted in food and tagged Jorinji, shio koji. Bookmark the permalink.